Author’s Note: This post first appeared on Upland Equations on May 28, 2013. This past Memorial Day Weekend, I had the opportunity to go camping with my family and some really good friends at one of my all-time favorite places, Birch Creek. Birch Creek is one of Idaho’s three sink streams that flow between majestic mountain ranges until they are either diverted for agricultural purposes or sink into the desert plain to reappear miles away at 1,000 Springs near Hagerman, Idaho. I have fished and love them all, but for me Birch Creek is just special. I figured out this weekend that I have been fishing this little creek now for 14 years and it never ceases to amaze or bless me. In my book, Heaven on Earth: Stories of Fly Fishing, Fun &amp; Faith, I wrote of this beloved creek: “Dad and I have found the mythical Fountain of Youth and it is a trout stream.” For this post, I thought I would share just a few select photos and passages from my journal from this awesome camping and fishing trip. 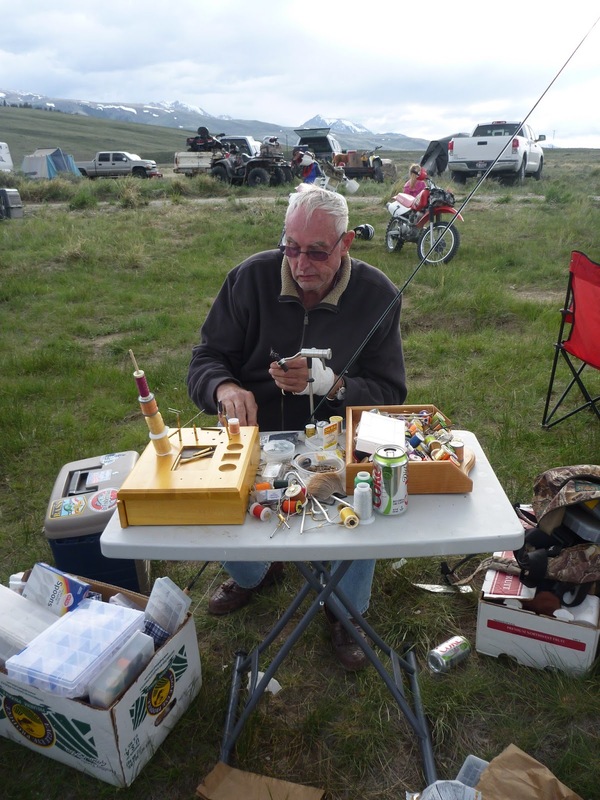 Dad’s fly-tying bench right on the banks of Birch Creek. Loved it! After breakfast Monday morning, I rigged up some other rods for the kids. I had promised my nine-year son Thomas before the trip that if he could catch a fish all by himself, I would give him five bucks. So I rigged up for him the new Ugly Stick with a Panther Martin. Tommy said to me as I prepared his rod, “Dad, if I can catch a fish all by myself, I don’t want $5.00, I want a soda.” That seemed like a pretty good deal to me. Of course, I didn’t explain to him how many sodas he could buy with $5.00. Try as he may, Tommy couldn’t get any takers on the new rod and I ended up having to don my waders to unsnag the Panther Martin. 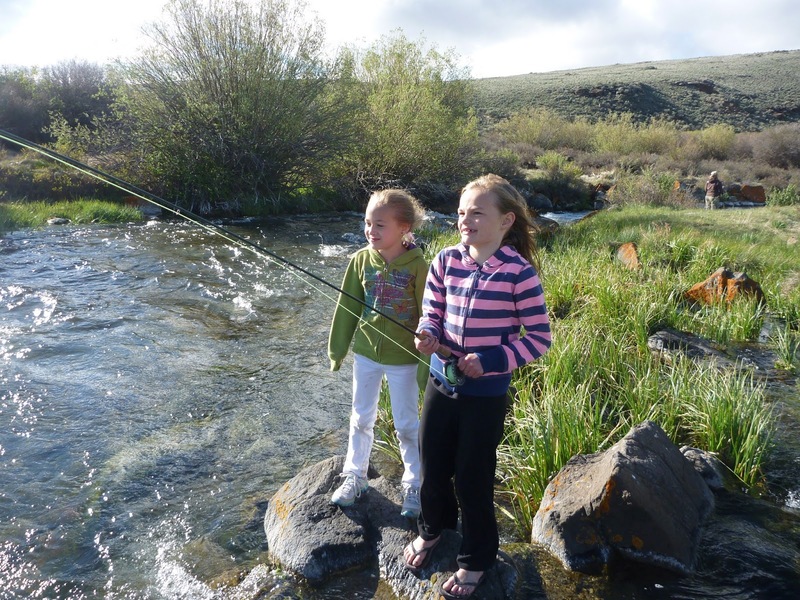 While the fishing was good, it was not epic as in years past, especially for little kids. 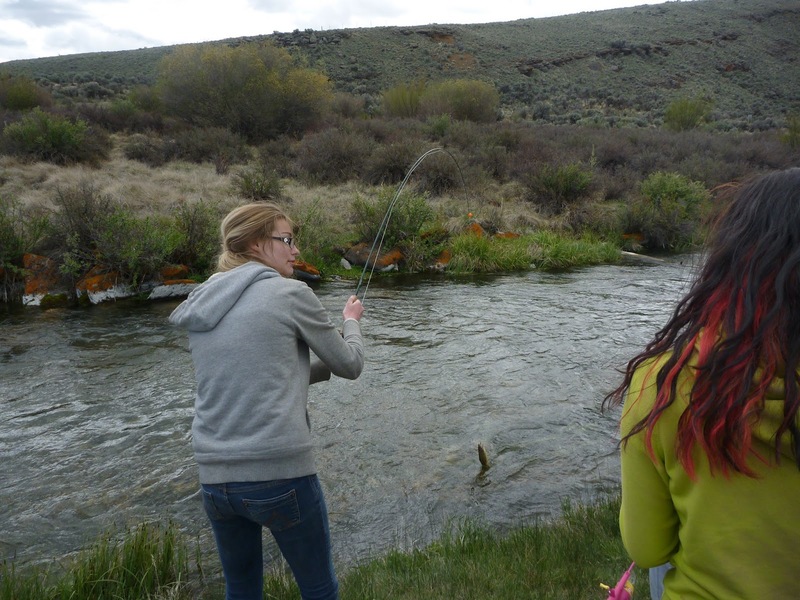 Eden reels in a nice Birch Creek trout. Nessy, the old pro, with a bent rod. 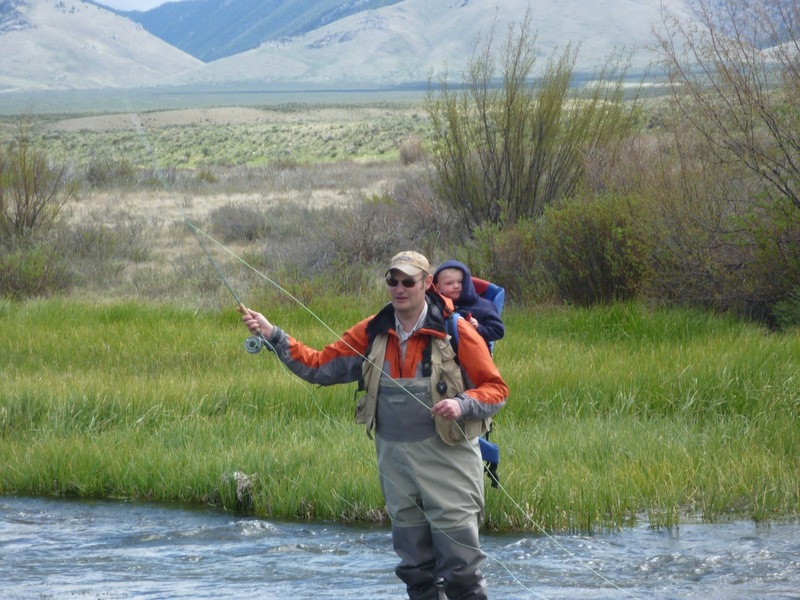 Later on that morning, I put my 18 month old son, Ben, into the backpack and took him fishing. He absolutely LOVED it!. When the strike indicator darted under water and I hooked a fish he giggled. I let him touch every fish and he did so with his little pointer finger. 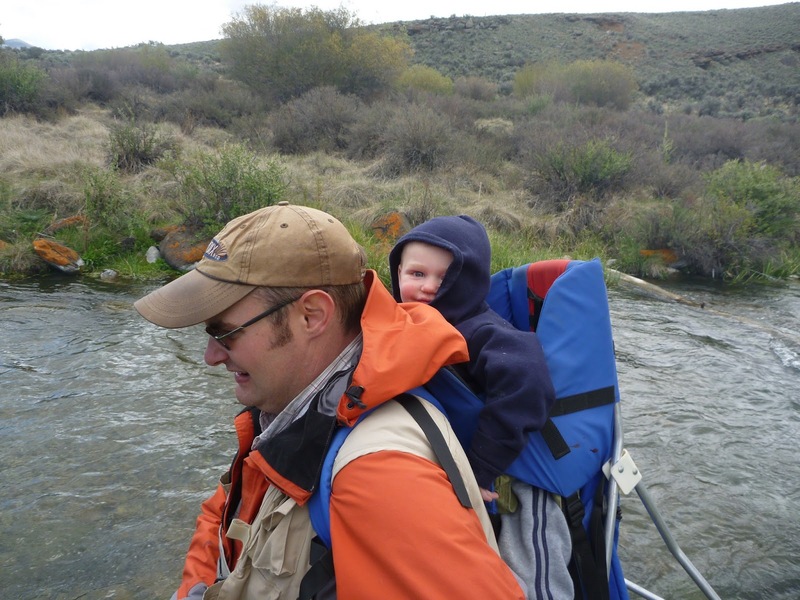 Ben truly enjoyed the water, fishing, and novelty of it all. We fished for about a half hour. 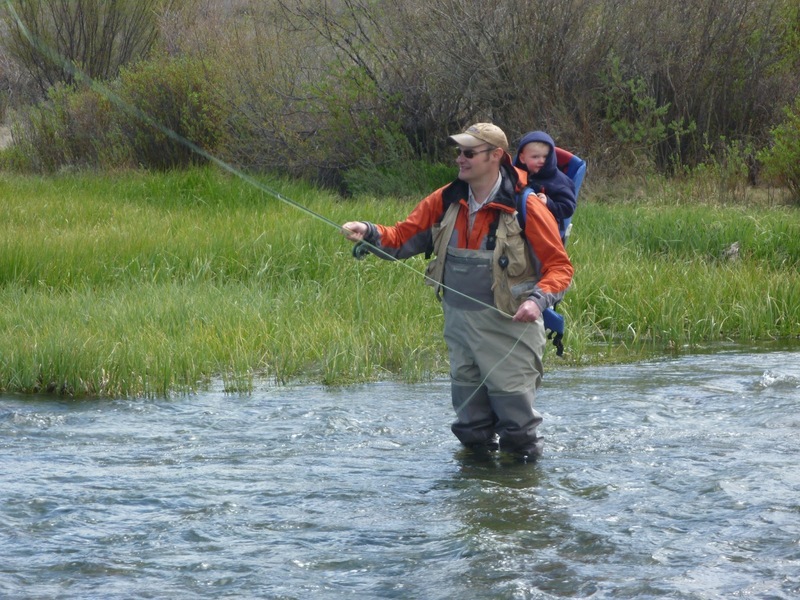 Back at camp, when I took off the backpack and got him out, he looked at me pleadingly, and said, “Backpack Again!” I understood that Ben wanted to go fishing again. It melted my heart. Of course, I obliged and put him back in the pack so we could fish some more. Dad and Ben fish together for the first time. Ben said to me, “Backpack Again!” A fisherman is born! After failing to catch anything on the Ugly Stick and Panther Martin, Tommy came over to me and said, “I want to try to catch a fish on the fly rod so I can get a soda.” I hesitantly agreed to let him try the fly rod, but was doubtful that he was ready for the complexity of fly fishing. I took him to this riffle below the big plunge pool. I showed him how to let the line and indicator straighten out downstream and then cast by flicking the rod tip forward, which Tommy did a few times. Meanwhile I was praying that God would help Tommy catch a fish. After drifting through the nice blue spot in the riffle, the indicator disappeared. My first thought was that Tom’s fly was stuck on the bottom. Oh me of little faith! Tom lifted the rod and the indicator darted sideways. Tom had a fish on. I whooped and hollered for my first son’s trout! I was so tickled and proud to watch Tom catch his first fish on the fly. Later on, we stopped in Mud Lake to get him an A&amp;W Cream Soda . . . and a box of Charleston Chews. After all, he earned it! Tommy’s very first fish on the fly that he caught all by himself. I have a close friend–actually, he’s more like a brother–named, Cliff Warmoth, who’s family also camped with us. 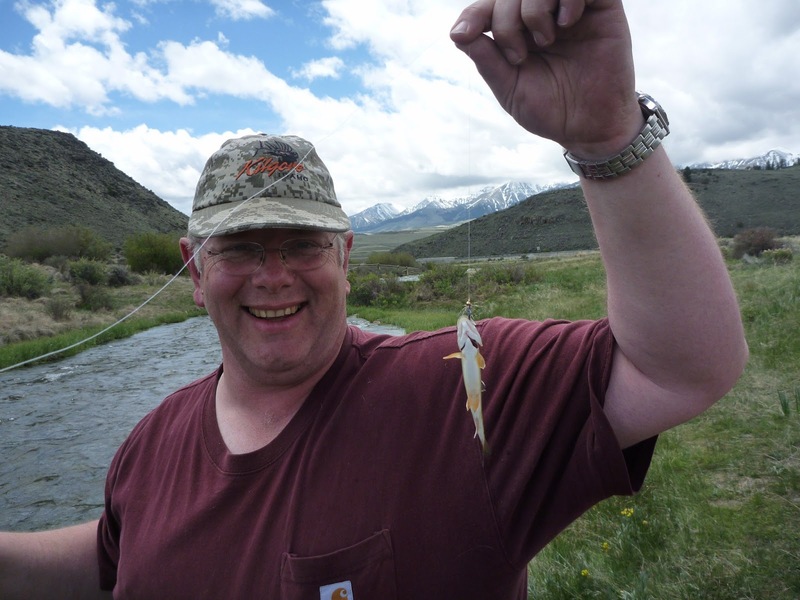 While Cliff loves the outdoors, he had never fly fished before our trip. 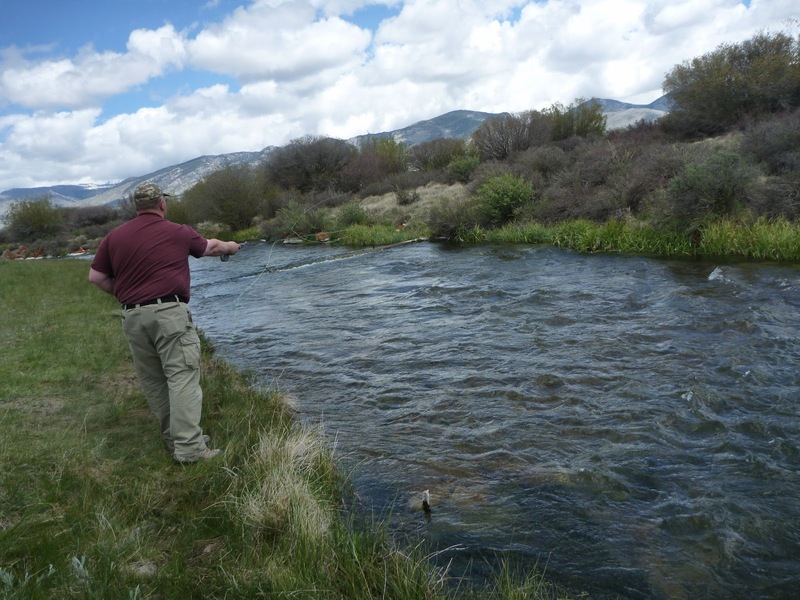 After lunch, Cliff wanted to give fly fishing a try and I gave him a few lessons about casting and mending lines and showed him where and how to fish, but mostly left him alone to try it out. He caught six trout by himself. Some were only as big as my pinky so I had to give him a hard time. 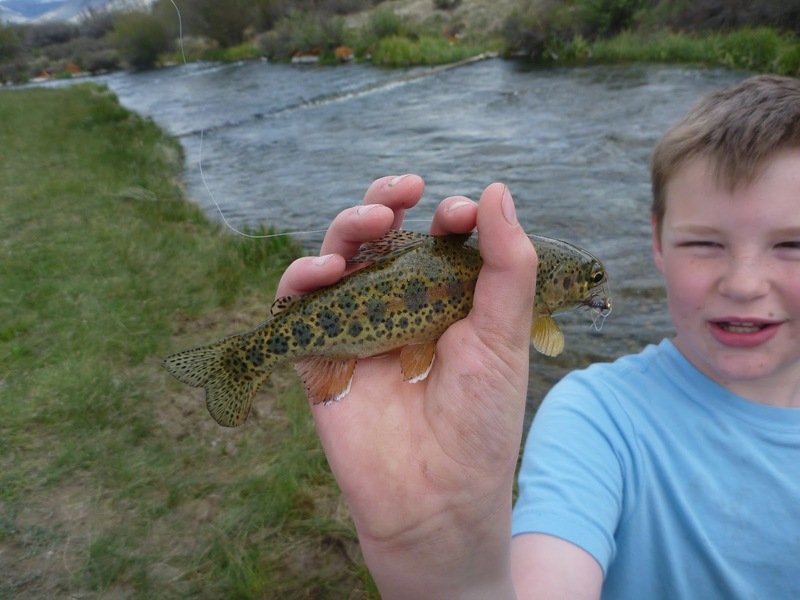 I nicknamed him, “the Tiddler,” for his tendency to catch tiny trout. He said afterwards that “That was fun! 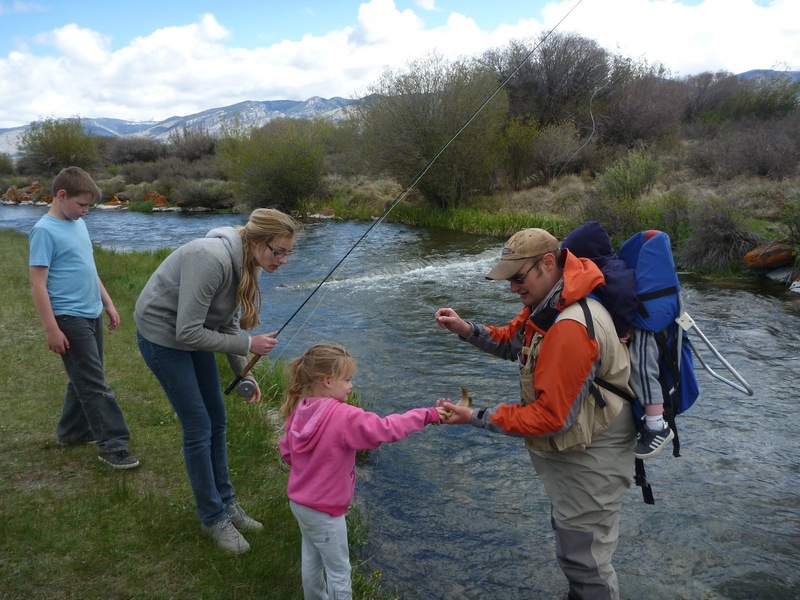 I’ll have to get a fly rod.” I brought five fly rods on the trip in hopes of fishing with my kids and friends and teaching anyone and everyone who wanted to learn to fish. So I was excited for Cliff and his success. Cliff Warmoth: The Tiddler Slayer. Cliff caught six fish his first time fly fishing. We left for home after 5:00 p.m. Everyone was sunburned, dust covered, but smiling, and we left behind plenty of fish with sore lips. I hated to leave. For me, there is something so special, even sacred, about this little creek. And to share it with my kids and friends just makes it that much more cherished. For sure, this was a day to remember. 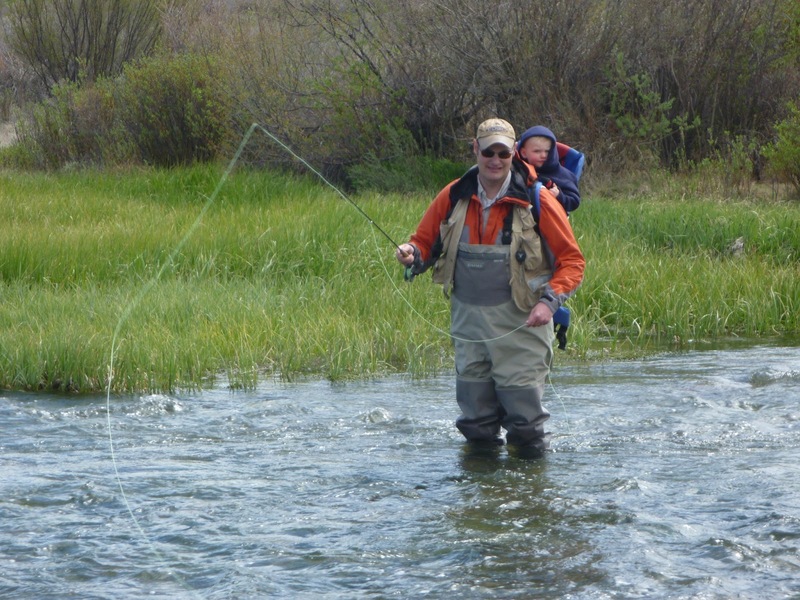 If you like this post, you’ll love my book, Heaven on Earth: Stories of Fly Fishing, Fun &amp; Faith. Here’s the link to the book’s website: www.heavenonearthbook.com.